University of Houston System Seal. Courtesy of the University of Houston System. Image available on the Internet and included in accordance with Title 17 U.S.C. Section 107. 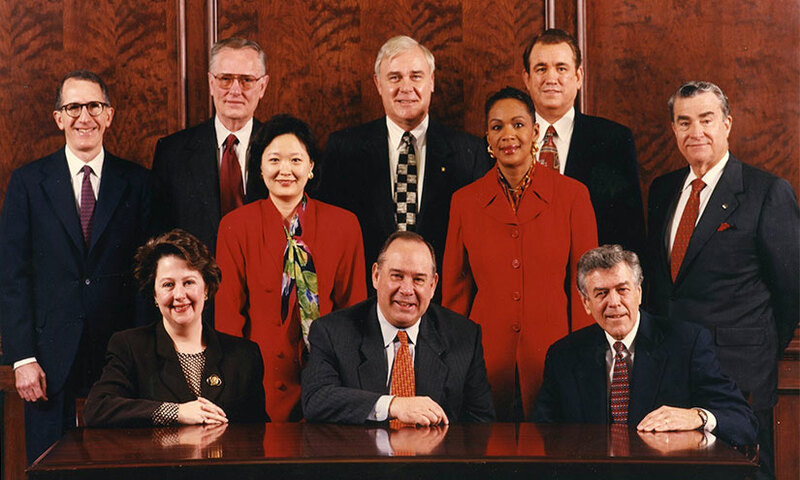 University of Houston Board of Regents from 1998. Arthur K. Smith, pictured standing center, was Chancellor at the time. Courteys of the University of Houston System. Image available on the Internet and included in accordance with Title 17 U.S.C. Section 107. UNIVERSITY OF HOUSTON SYSTEM. The University of Houston System, governed by a board of regents, provides leadership, coordination, and support for activities of four public universities—the University of Houston, the University of Houston Clear Lake, the University of Houston-Downtown, and the University of Houston-Victorica and two multi-institution teaching centers—the University of Houston System at Sugar Land and the University of Houston System at Cinco Ranch. The system, which conducts academic, fiscal, and other functions, was established by the Sixty-fifth Legislature in 1977 on the institution's fiftieth anniversary, with overall administration by a chancellor and a president at each of its four separate universities. At that time, the University of Houston comprised thirteen colleges and schools, enrolled over 30,000 students, including almost 2,400 foreign students, and had the highest population of minority students of any Texas university. It conferred bachelor's degrees in seventy-eight fields, master's degrees in forty-six fields, and doctoral degrees in thirty fields. In 1995 William P. Hobby, the former lieutenant governor of Texas, agreed to serve a two-year term as chancellor. Hobby led a systemwide organizational review and restructuring which led to the creation of the new position of chancellor of the UH system and university president. In 1997 Arthur K. Smith became the first to fill this combined position. KUHT-TV, which began in 1953 as the nation's first public educational television station, is licensed to the University of Houston System Board of Regents. In 2000 the station moved to the new LeRoy and Lucile Melcher Center for Public Broadcasting on the University Park campus. A companion digital station, KUHT-DT, went on the air in 2001. Handbook of Texas Online, Diana J. Kleiner, "UNIVERSITY OF HOUSTON SYSTEM," accessed April 18, 2019, http://www.tshaonline.org/handbook/online/articles/kcunr. Uploaded on June 15, 2010. Modified on July 21, 2017. Published by the Texas State Historical Association.